Most eucalyptus trees are moderately-sized but come to their native land, Australia, and you will be surprised at how tall these trees can grow. Indeed, eucalyptus are one of the tallest trees in the world rivaling the coast redwoods of North America. Eucalyptus is not a single species. In fact, it’s the genus, with more than seven hundred species under it. Nearly all of them are native to Australia. The tallest among them is eucalyptus regnans, colloquially known as mountain ash, which regularly grows above 85 meters. It is also the tallest flowering plant in the world. Currently, the tallest living eucalyptus, a member of eucalyptus regnans, is 99.6 meters tall. It’s nicknamed Centurion, and it grows in southern Tasmania. For comparison, the tallest coast redwood, the Hyperion, is 115.6 meters tall —only 16 meters taller. In the not-too-distant past, the Tasmanian mountain ash had reached heights greater than today's giants. In 1881, a surveyor, George Cornthwaite, measured a felled tree in Victoria at 114.3 meters. That tree was about 1 meter shorter than Hyperion. In 1872, the Inspector of State Forests, William Ferguson, discovered —as he indicated in a letter— a fallen tree that he measured to be 133 meters tall. The tree was burnt by fire, and before it fell, Ferguson believed the tree might have been 150 meters tall. Similar claims of exceedingly tall trees have come from several other people. Ferdinand von Mueller reported to have personally measured a tree at 122 meters, while nurseryman David Boyle, claimed in 1862, to have measured a fallen tree at 119.5 meters. 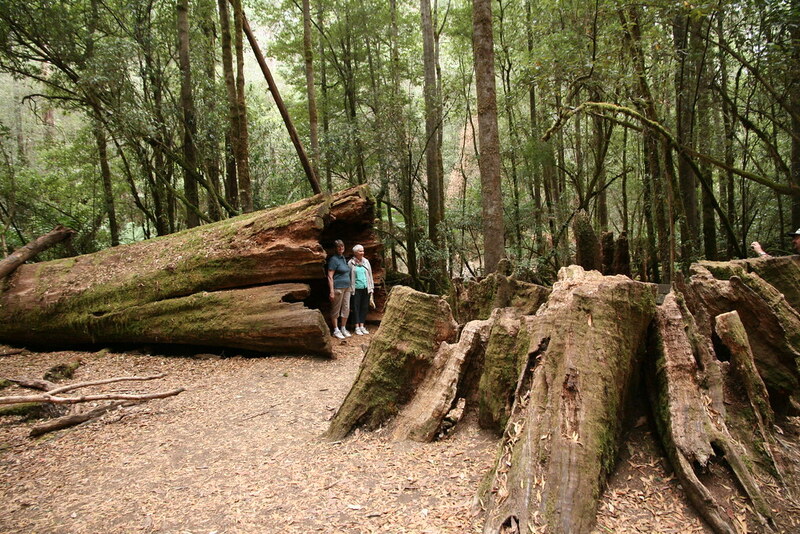 The tree, which broke when it fell, might originally have stood at 128 meters. Unverified reports of trees measuring up to 146 meters also exist. Eucalyptus of such great heights are hard to find today because most trees never get the chance to live their full life. The average lifespan of the Tasmanian mountain ash is about 400 years. The tree gains most of its height in the first 90 years of their lives, after which their growth slows down. At this point they either become victims of bushfire and fungus, or they are felled by humans. The Tasmanian mountain ash is valued for its timber, and has been harvested in very large quantities since the early 1800s. Historically, loggers have always targeted the biggest trees because they produced more wood. As a result, the forests have been depleted of large old trees. Today, only a small percentage of mountain ash trees alive in pre-European Tasmania are still standing. Unlike the redwoods, the mountain ash is not a protected species, and very few trees fall within areas designated as National Park or World Heritage environments. Most lie within areas controlled by the state forestry management authorities where they are commercially harvested. But this is about to change. In June 2013, the World Heritage Committee extended the boundary of the Tasmanian Wilderness World Heritage Site by over 170,000 hectares. This means that many mountain ash trees will enjoy the highest level of protection in the world, that will allow them to live out their lives in full. And if conditions work in their favor, in future they might even beat the redwoods to the title of the tallest trees in the world.